What the blurb says: “The car that ploughs into the bus stop early one morning leaves a trail of death and destruction behind it. DS Ferreira and DI Zigic are called in from the Peterborough Hate Crimes Unit to handle the investigation but with another major case on their hands, one with disturbing Neo-Nazi overtones, they are relieved when there seems to be an obvious suspect. But the case isn’t that simple and with tensions erupting in the town, leading to more violence, the media are soon hounding them for answers. Eva Dolan’s debut novel LONG WAY HOME was one of my favourite books of 2014, so I was super excited to get an early copy of the second book in the DS Ferreira and DI Zigic series – TELL NO TALES. Ferreira and Zigic are assigned to investigate the hit and run, but what at first seems a fairly straightforward case soon turns out to be far more complex than they’d originally thought. Alongside the hit and run, they’re still struggling to find suspects in a chain of recent murders. The brutal, racially motivated attacks have already claimed two victims, but Zigic’s boss wants the motive for the murders downplayed. The attackers are well prepared and ruthless, beating their victims to death and even playing up to the CCTV cameras they know are filming them. But even with video and forensic evidence, the detectives are no closer to identifying the killers. And things are going to get worse, a lot worse, before they get more leads. With tensions rising, and violence escalating, the two investigations begin to blur, and Ferreira and Zigic find their skills, and their resolve, tested to their very limits. As in the first book, Ferreira and Zigic make a great duo, with Ferreira’s bold ‘tell it as it is’ attitude perfectly off set by Zigic’s more steady, measured, but no less determined approach. As the investigation progresses they deal with the challenges and try to cope with the shocking brutality of the cases in their own individual ways, but despite their differences, and Ferreira’s reservations about the additional officers assigned to Hate Crimes to support them, they work well together to unravel the complex and interwoven connections that have led to these extreme acts of violence taking place in the town. What I especially liked about this novel was the characterisation. All the characters are so well drawn, from the witnesses and victims who are withholding information, to the suspects who refuse to talk, and the increasing political posturing and media manipulation from those looking to use the violence to whip up more unrest. 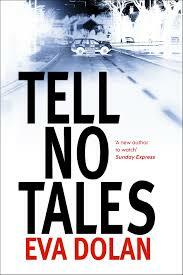 A compelling story, beautifully crafted, TELL NO TALES has tension crackling off every page. This is a must-read for police procedural fans. I’ve got this on my TBR pile, and I can’t wait to read it.